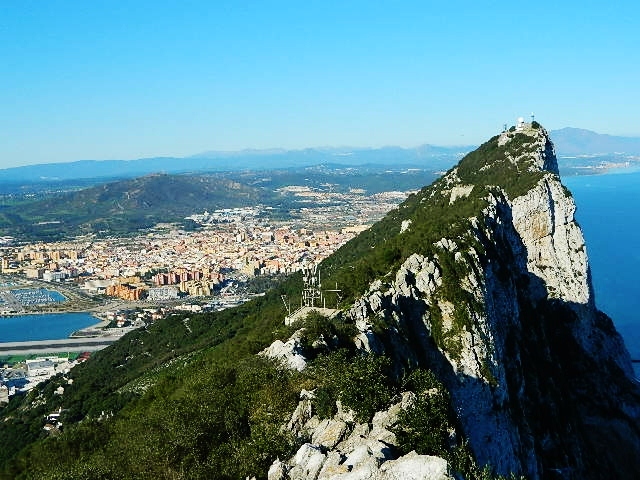 A territory of Great Britain, Gibraltar is a peninsula located Southeast of Rota, Spain and can be reached by car in a little under 2 hours. 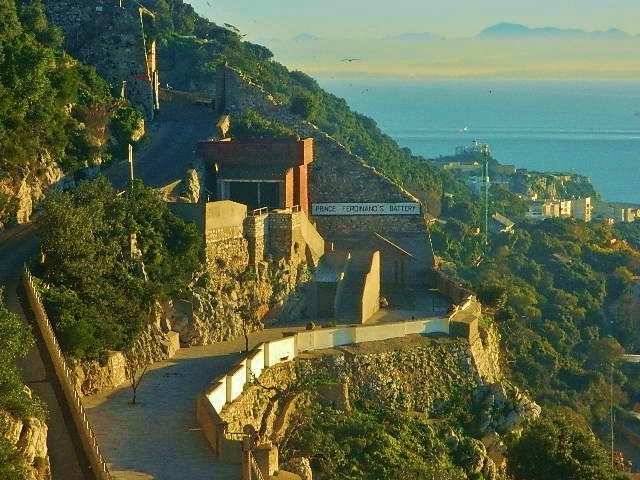 As you snake through La Linea, the Spanish town which borders Gibraltar, the giant rock comes into view along the coast where the Strait of Gibraltar divides the Mediterranean Sea and the Atlantic Ocean. 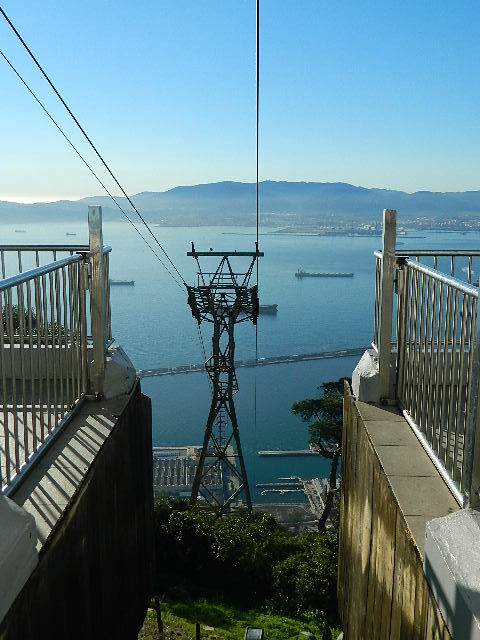 There are basically three ways up and down the Rock of Gibraltar...cable car (highly recommended for going UP), a series of stairs, and a series of narrow roads, which are available for people to actually drive up, but parking is very limited at the top, so this is not recommended. 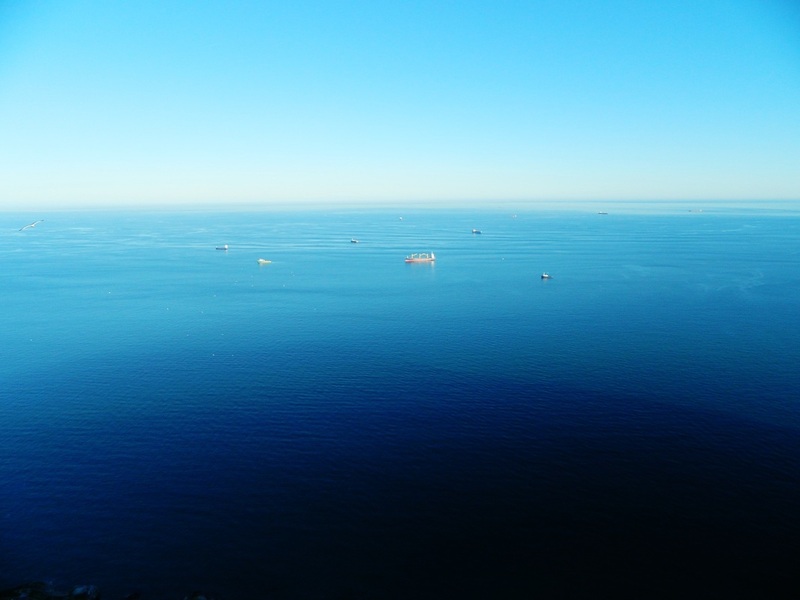 Gibraltar is a great escape, especially if, like me, you are an American living in Spain and just need a reminder every once in awhile what English sounds like. 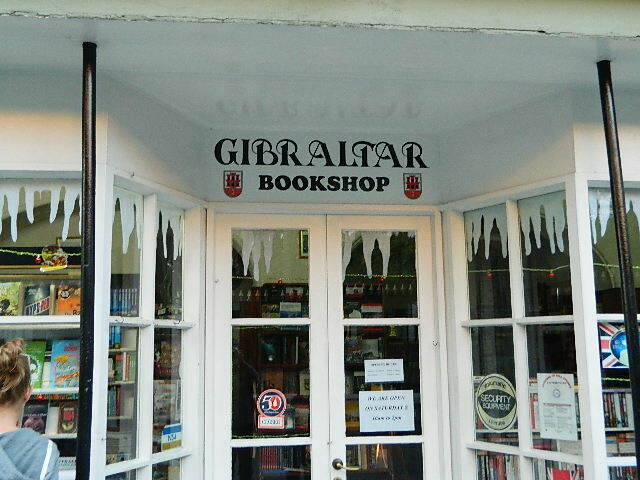 English is the official language in Gibraltar. 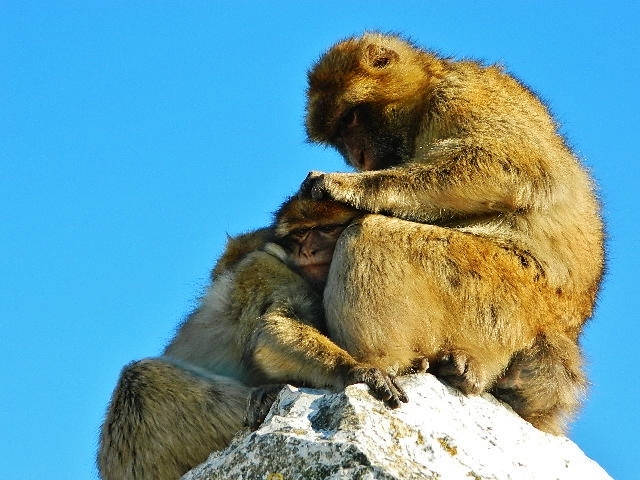 One of the things Gibraltar is known for is the colony of nearly 300 Barbary Apes that inhabit the upper portions of the rock. The "apes" are a species of tailless monkeys called Barbary Macaques. These Macaques are found primarily in Morocco and Algeria, but the ones that populate Gibraltar are the only free-living monkeys in Europe today. These apes are something to see...ranging from babies to fulll-grown adult males, they are at once adorable, and intimidating. Despite it being against the law for tourists to feed them, unfortunately people still do. I watched a guy come out of the cafe with a bag of chips and toss them to the ape pictured below, who immediately opened them and consumed the entire bag. 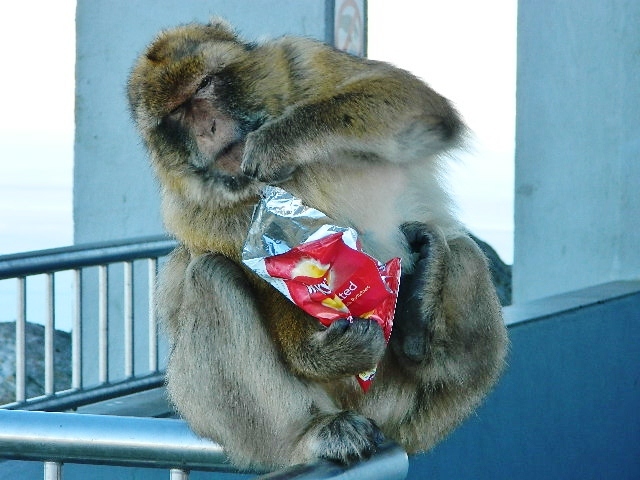 While the apes are essentially wild animals, they are cared for by the Gibraltar government. They are fed at regular times (to reduce the chances they will leave the rock and head into town in search of food, which they have done before, with disastrous results), although part of their diet is the natural vegetation which grows on the rock. Also, each birth is recorded and every monkey is given a name, and each death is recorded. This helps the government keep tabs on how the population as a whole is doing. The town of Gibraltar is charming and quaint. Shopping and dining options abound, including some great places for English Fish and Chips. Also, historical sites dot the cobblestone pedestrian walk, including monuments to former military leaders, and a beautiful Catholic church. 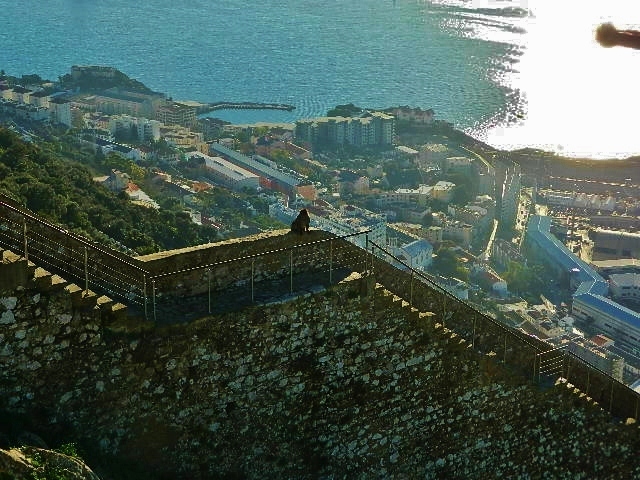 From shopping to dining to apes and breath-taking views, Gibraltar has it all!